Numerous Highland County emergency responders were on hand Friday for the funeral procession for Clermont County Sheriff’s Deputy Bill Brewer, who was gunned down last weekend while responding to a suspected suicide attempt by a man barricaded inside an apartment some 20 miles east of Cincinnati. One of the first responders was Highland County Sheriff Donnie Barrera, who said he and other local responders were there to show their support for law enforcement. “Anytime an officer goes down in the line of duty like that, we want to be there for the family — for now and forever,” Barrera said over the phone as he made his way home from the service. He said his cruiser was staged with 200 to 300 other emergency vehicles at West Clermont High School, where he could not see the church where the services took place since the funeral procession was about 10 miles long. Among other Highland County officers in attendance were Chief Deputy Branden Stratton, and Sergeants Scott Cooper and Craig Seaman from the sheriff’s office; Chief Darrin Goudy, Patrol Officer Andrew Gosink and Administrative Assistant Claudette Green from the Hillsboro Police Department; and School Resource Officer Kevin Little from the Greenfield Police Department. A GPD spokesperson said Little had attended school with Brewer. Barrera said the Brushcreek Township Volunteer Fire Department in Sinking Spring, the Southern Highland Volunteer Fire Department in Mowrystown and the Lynchburg Area Joint Fire and Ambulance were also represented. 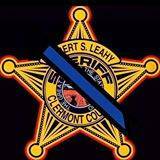 Brewer, a 20-year veteran sheriff’s deputy, was the fifth police officer in the extended Cincinnati law enforcement community to die in less than two months. Another officer was wounded in the leg during the apartment complex incident that claimed Brewer’s life. Uniformed officers from multiple departments helped pack a church for funeral services for Brewer. The Associated Press contributed to this report. Reach Jeff Gilliland at 937-402-2522.